Bechstein's bat is a medium-sized bat with a wingspan of 250-300mm. It has reddish brown dorsal fur and characteristic long ears that can reach 8 - 10mm beyond its muzzle. 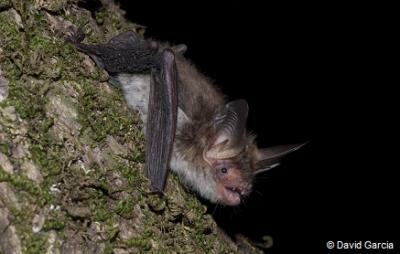 A rare bat in Europe, it is closely associated with mature, deciduous woodlands (beech and oak) and is known to roost in tree holes, tree trunks but also underground. While male M. bechsteinii tend to be solitary, females gather in maternity roosts of up to 30 individuals. This species uses quiet echolocation calls (a 'whispering' bat) for hunting in a cluttered environment and picks moths, beetles among other insects off foliage or the ground. M. bechsteinii is a very sedentary species with summer and winter roosts only a few kilometers apart. 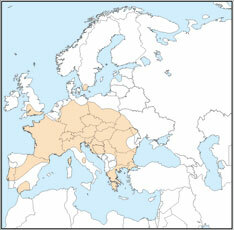 M. bechsteinii is distributed across central and southern Europe (including islands) and in the Caucasus region and Asia Minor. Threats to this species include the inappropriate management and development of woodland habitats, intensive agriculture and human disturbance of roost sites.